Fishburners Brisbane has a number of bookable spaces and existing solutions for displaying meeting room use either didn’t work – Reservator – or turned out to be very expensive to maintain… so I rolled my own solution. 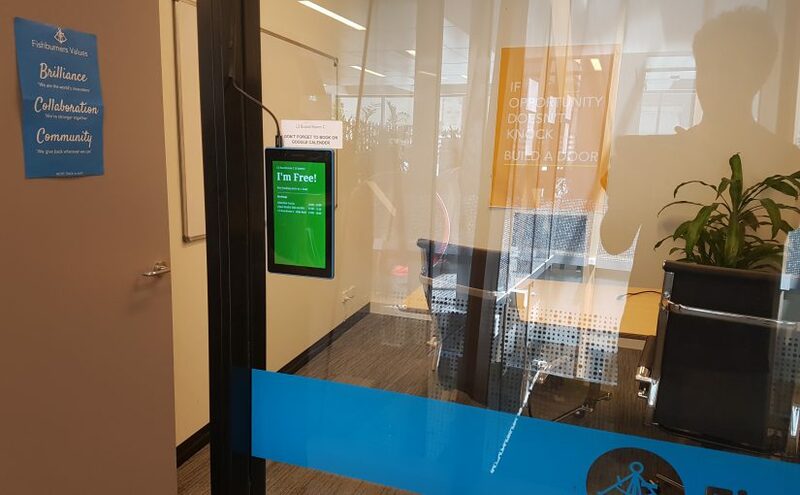 The meeting room web App runs permanently on all 12″ Android tablets displaying a custom Page Template per meeting room managed by WordPress which is hosted on a networked Raspberry Pi within our intranet. The custom Page Template refreshes the tablet screen content every 30 seconds and using the WordPress CRON refreshes known Calendar events every 15 minutes. Room Calendar data is currently stored within a custom Post meta linked to a Custom Post Type but will be migrated to an individual Custom Post Type just for managing Calendar event instances that are linked to Rooms. As this solution develops I’ll move the WordPress instance to an external domain generating a secret URL for each meeting room before opening up the platform to new users.